BOCA RATON — Boca Terry, a global manufacturer and distributor of price-competitive bathrobes, towels, and spa accessories, has announced the launch of its newest wholesale product: the Medi-Robe. Designed specifically for the healthcare industry, the Medi-Robe is a departure from the standard, paper-thin hospital gowns that hospital staff and patients have endured for decades. 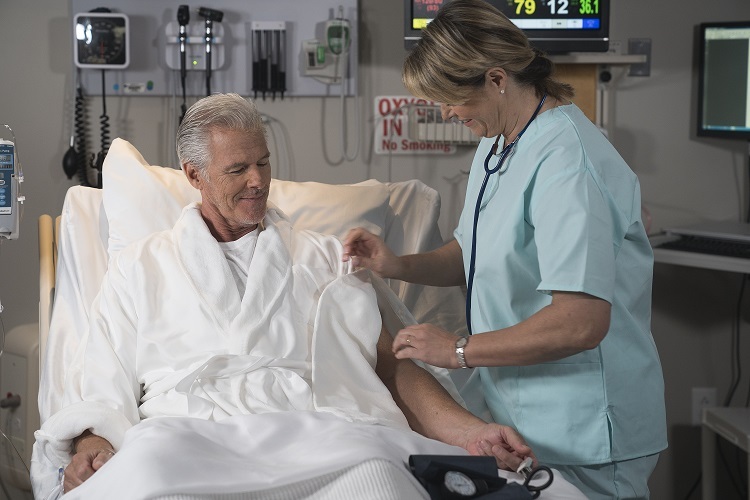 The Medi-Robe features convenient plastic snaps that appear on both sleeves of the robe from collar to cuff, allowing the robe to be slipped on or off without affecting any tubing or ports on the arms. Medical staff can perform hassle-free blood pressure tests and place or adjust IVs simply by opening one or more snaps on the sleeves. Patients’ heart monitors fit comfortably in the built-in breast pocket, which features a small hole to accommodate a wire. And because the Medi-Robe offers complete coverage, patients can now walk the halls with discretion. In 2017, the Mayo Clinic became the first hospital system to implement the Medi-Robe at its Jacksonville campus. Boca Terry frequently consults with hospital systems, clinics, nursing homes, senior living facilities and wellness centers to understand their needs, assess their budgets, and determine which robe and style will work best. The Medi-Robe is 100% customizable, available in more than 20 distinct styles and a range of fabrics—including cotton, terry, velour, and microfiber—and can be embroidered with any institution’s name and/or logo. Click here to see the Medi-Robe in action. To learn more, please contact Princess Arevalo at (877) 421-6001 ext. 225 or by email at parevalo@bocaterry.com. Since 1996, Boca Terry has manufactured affordably luxurious bathrobes, towels, and spa accessories, distributing their products to wholesale and retail clients around the world. Boca Terry is a trusted, long-time supplier to top-tier hotels, resorts, spas, cruise lines, members clubs, medical facilities and promotional product companies. Visit BocaTerry.com.